With 2018 coming towards an end, the World Meteorological Organisation (WMO) released their provisional State of the Climate report. The WMO asked whether Climate Lab Book could provide some updated graphics, also reproduced here. What does ‘mean’ actually mean? Are you a user of global temperature data? If so, have you ever thought about the meaning of the word “mean” in “global mean surface temperature”? Climate change is a complex global issue, requiring simple communication about its effects at the local scale. This set of visualisations highlight how we have witnessed temperatures change across the globe over the past century or more. 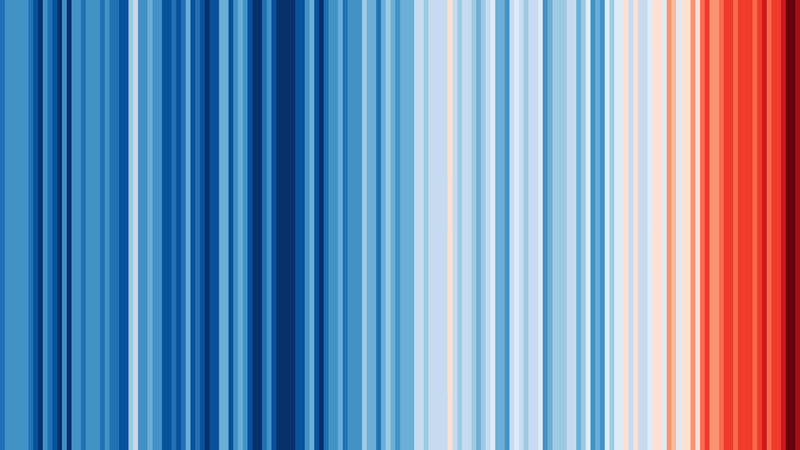 The colour of each stripe represents the temperature of a single year, ordered from the earliest available data at each location to now. All other superfluous information is removed so that the changes in temperature are seen simply and undeniably. John Tyndall: founder of climate science? John Tyndall (c.1822–1893), Irish physicist, mountaineer, and public intellectual, is best known for his work on the absorption of heat by gases such as water vapour and carbon dioxide in the atmosphere (and for explaining why the sky is blue). Seen in retrospect, he is a critical figure in the history of climate science. Yet this retrospective view hides a complex, and in many ways more interesting story. In The Ascent of John Tyndall, the first major biography of Tyndall for more than 70 years, I unpick the motivations behind Tyndall’s work on the absorption of heat by gases, which started in 1859, and the manner in which he interpreted them. Data: E-OBS v17 gridded rainfall dataset. Calculated as the number of gridpoints per calendar year with daily rainfall amounts over 25mm, divided by the number of gridpoints. 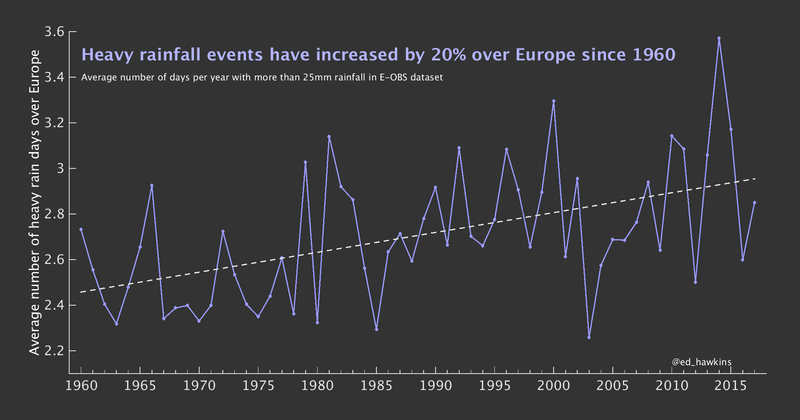 Twenty years ago, the trend in annual mean global mean temperature became detectable. Ten years ago, regional seasonal mean temperature trends were becoming clear. Nowadays, we can see trends even in weather extremes. In this post I show trends in long-term meteorological station data for hot, cold and wet extremes, and share some thoughts on tropical cyclones and droughts. It is underpinned by a decade of studying these around the globe, often in collaboration with the WWA team. I make no claims for completeness: the world is large and complicated, and I simply do not know all the literature.